Even though I knew that Tom and C won’t eat asparagus and I wasn’t sure if my cousin or her boyfriend would either, I really wanted to make this appetizer. I haven’t had prosciutto in forever! Almost every time I visit my aunt at her beach house in Delaware, she’ll have honeydew melon slices wrapped in prosciutto as an appetizer before dinner. Yum, yum, yum, yum, yum! Preheat the oven to 450 degrees. Lightly spray a baking sheet with cooking spray. Spread a small amount of cream cheese onto each prosciutto slice. 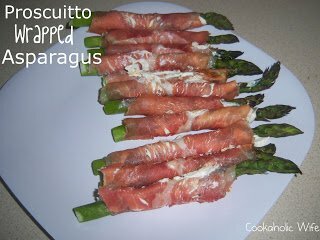 Place the asparagus stalk at the top of the prosciutto slice and roll up until the end of the slice. Repeat with remaining asparagus and prosciutto. Bake for 10 minutes or until the prosciutto is slightly crispy and the asparagus is tender. I was expecting this to have a bit more flavor than it did. I think next time I’ll use a flavored cream cheese, maybe a veggie one or something to add a little more kick to this.